Harry Harrison Kroll (1888-1967). Novelist, short story author, illustrator, professor. Kroll taught English composition and literature at the University of Tennessee at Martin between 1935 and 1958, and at Lincoln Memorial University between 1926 and 1928. At the latter he was a literary catalyst for Appalachian writers Jesse Stuart, Don West, and James Still. Born in 1888, Kroll spent most of his childhood in Dyersburg, Tennessee and his teen years and young adulthood in southern Alabama. Never formally education as a child, he nonetheless hammered together enough informal education on his own and with tutoring to qualify for a teaching certificate. Between 1911 and 1920 he taught in Alabama's rural schools. Marrying Annette Heard in 1911, he enrolled for a college education at Peabody College for Teachers in Nashville, Tennessee, where he took baccalaureate and masters' degrees in 1923 and 1925. At Peabody he began selling short stories to the city's periodical publishers. During his career, story papers and magazines published over 900 pieces of short fictions and essays. 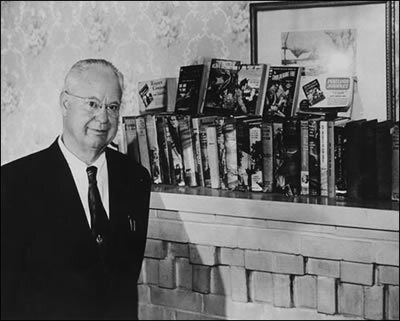 Beginning in 1928 he became a novelist and eventually added another 27 volumes to his list of publications. His work is notable for a gritty realism focusing on rural life of the American South. By his own account Kroll "was not much of a keeper," but at his passing material that could be located easily was given to the University of Memphis. Remaining material in family hands passed to the custody of the University of Tennessee at Martin decades later. The institutions have cooperated in consolidating the Kroll material so that literary manuscripts and tearsheets are in the Mississippi Valley Collection at the University of Memphis and correspondence is at the University of Tennessee at Martin. Each institution has duplicates of the Kroll papers held by the other institution. In addition, the duplicates collection at UTM has gathered copies of the extant materials related to Kroll and his work held by other institutions, except those in the Hodges Library collection at the University of Tennessee, Knoxville. The University holds examples of each book in which Kroll's work appeared, in all identified printings and binding variants, as well as presentation copies of works inscribed to various family members and friends. Kroll's published output is described in Richard L. Saunders, Harry Harrison Kroll: The Works (Caramon Press, 2009). The collection contents are accessible through the Paul Meek Library catalogue. Published and unpublished short story manuscripts, and tear sheets (primarily juvenile short stories and early pulp publications), incomplete "teacher story" manuscript. Correspondence, book contracts, clipping scrapbooks, pen-and-ink drawings. Obituaries, posthumous remembrances, photographs, personal letters from Harry Harrison Kroll, estate papers relative to copyright renewal registrations. Correspondence between Kroll and a close friend from Kentucky, together with manuscripts, including the amended manuscript for Riders in the Night. Notes, drafts, and duplicated correspondence from Whitt's dissertation on Kroll's characters, including a few photocopied Kroll letters which do not exist in other collections. Kroll (Harry Harrison) Papers. Z0234. Mississippi State Archives and Library, Jackson, Miss. Manuscripts for Keepers of the House, The Usurper, Their Ancient Grudge, and one essay. The collection is available in photocopy at the Univ. of Tennessee at Martin. [Harry Harrison Kroll book manuscripts], Univ. of Tennessee, Knoxville, Tenn. Corrected typesetter's manuscripts for Darker Grows the Valley (MS 6), I Was A Sharecropper (MS 7), The Rider on the Bronze Horse (MS 202), Riders in the Night (MS 382), Rogues' Company (MS 203), and Their Ancient Grudge (MS 8). Bobbs-Merrill Manuscripts. Lilly Library, Indiana University, Bloomington, Ind. Correspondence relative to Bobbs-Merrill's review and publication of Kroll's novels, contained in box 104 of the collection. A file relating to Nettie Kroll's book Return Not Again is in the same collection. United Artists collection. Box 49. Wisconsin Historical Society, Madison, Wisc. Developmental material for Paul Green's screenplay adaptation of Kroll's The Cabin in the Cotton for First National Pictures, including two developmental story outlines, a full screenplay with corrections, and film press book. Duplicate copies at the Univ. of Tennessee at Martin. Jesse Stuart Papers. Box 61. Univ. of Louisville, Louisville, Ky. Letters to former student and Kentucky regional writer Jesse Stuart, 1940–1944, may be found among Stuart's correspondence. Available in duplicate at the Univ. of Tennessee at Martin. Street & Smith editorial records. Box 27. Syracuse University Library, Syracuse, N.Y.
Kroll is documented in the records of this pulp magazine publisher by the firm's card-file tracking system, which provides a record of payments made to authors for their manuscripts. The collection also includes two edited short story manuscripts by Kroll. Photocopies available at the Univ. of Tennessee at Martin.